Available only at The Container Store, our exclusive Elfa Gliding Tiered Shelves are a clever way to store canned goods or spices in a pantry or even baby shoes in a nursery closet. The tight mesh material of each shelf keeps items from falling through. Supported by two 16" Ventilated Shelf Brackets, it glides out for easy access to whatever you are storing. Glide it back into position to conserve space. It can be mounted on Easy Hang, freestanding or Mounted Standards. Available only at The Container Store, our Double Rail adds even more versatility to any Elfa solution. Use it to organize magazines, tissue paper, necklaces or scarves. Attach Shelf Hooks and hang jackets, hats or keys. The possibilities are virtually endless. Platinum Elfa Gliding Tiered Shelves is rated 5.0 out of 5 by 7. Rated 5 out of 5 by Lisa19 from Love The Gliding Tiered Shelf! This is so ideal for a pantry! Glides out smoothly. Tiers allow you to see everything like spices and cans that can "disappear" in the pantry shelf. You can fit a lot on there! We have 2 for our pantry and plan to order a third. My only suggestion would be to offer an additional height so that the concept can be used for taller bottles and items. Rated 5 out of 5 by Gingernutter from Love tiered shelves! 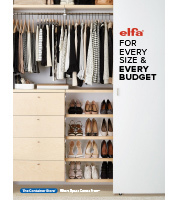 These shelves are what sold me on doing an Elfa pantry install with The Container Store. Being able to see and reach all cans/jars in an instant is such a massive treat!! One of the things that annoyed me about the old pantry was digging through the basket of cans to find what I need and buying doubles of things I had but were buried in the back. Not anymore - these shelves are wonderful! Is there a 24&quot; to go with all the other 24&quot; products that I have used in both my pantry and closet? It is now available in the 24&quot;! I just had my pantry system designed, and even the Designer was surprised to see the 24&quot; was available...must be a recent add to their inventory! What sizes of canned food does this shelf hold? How many 14-16 oz cans will a shelf hold? What is the height of a shelf loaded with 14-16 oz cans? How deep is it when it&rsquo;s fully extended? 29.5 fully extended When installing in a closet/pantry make sure you place the vertical beams &quot;inside&quot; the door frame or you won't be able to fully extend it. Do I need to buy the two 16&quot; shelf brackets separately? Yes, the two 16&quot; elfa Ventilated Shelf Brackets are sold separately (shown below). How many shelves loaded with 14-16 ounce cans can a set of brackets support? Each elfa 18&quot; Gliding Tiered Shelf requires two elfa Ventilated Wire Shelf Brackets. What are the dimensions of the 2' gliding shelf? Hi! Is it 2' long and deep? Please provide specific dimensions, thanks! The 2' shelf is 2 ft. wide x 16&quot; deep. Are there any plans to offer this in a 2' version? At the moment, our elfa Gliding Tiered Shelf is only available in an 18&quot; format. Additions to the elfa line are made periodically, so a 24&quot; format is a possibility. What are the dimensions of the gliding tiered shelf - depth and width ? The actual dimensions of our elfa 18&quot; Gliding Tiered Shelf are 17-5/8&quot; x 16-7/8&quot; x 2-1/2&quot; h. Product dimensions can be found to the right of the description copy and bullet points.